Johnny Frierson - singer, writer and guitarist - was born in Memphis on 25 June 1945 and started his professional music career as a member of the Sunset Travellers while O V Wright was still their lead singer. He played guitar on their recordings of "On Jesus' Program" and "Another Day Lost". While still contracted to Don Robey via the Travellers, Frierson decamped to Stax and signed as a singer and a writer. He recorded with his sister Mary (who went on to become solo artist Wendy Rene) Marianne Brittenum and Walter Mondie as the Drapels. 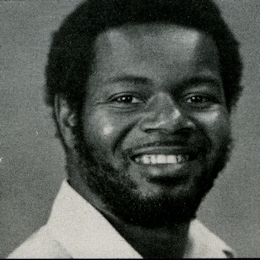 Frierson also cut backing vocals for the likes of Rufus Thomas and his daughter Carla and, reportedly, Otis Redding as well. 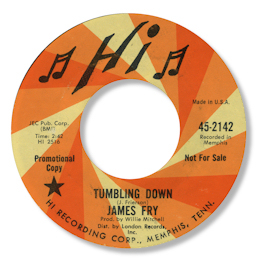 But he did make one solo recording as James Fry, this excellent double sided effort for Willie Mitchell before he left music alone. “Still Around” is a typical chugging Hi midpaced track, on which Fry sounds really strong, with some tasty touches of delay in his timing, and a lovely warm tone. Mitchell pute a huge amount of echo on the vocal track as he does on the deep flip. Tumbling Down is rightly celebrated as a classic of the genre – lovely guitar from Teeny Hodges, and some great horn blasts are the key features behind Fry’s passionate vocal performance, aided by some harmony vocalists, which may well include his sister. The two other tracks from the session were never released at the time of recording but have surfaced on compilation LPs and CDs, particularly from the UK. “I’ve Got Enough” is a hard driving dance tune with that Mitchell stamp all over it. Mama’s Boy is another strong deep ballad with an unusual lyric. Both these cuts were quite good enough to be released, and indeed were given master numbers, but for some reason they never got issued. Perhaps his best effort while he was at Hi was co-writing with sister Mary the outstanding “I’ll Go Crazy” for Tony Ashley and Don Bryant. This part of Fry’s life was interrupted by Uncle Sam and when he returned to Memphis he went to college and started a new life in the construction industry. His only participation in music since then would appear to be writing songs for the Sunset Travellers and playing some guitar in Blues Alley. 1. The two other tracks from this Hi session “Mama’s Boy” and “I’ve Got Enough” can be found on the Hi UK CD “Rivertown Blues / The R'n'B Sessions / Soul Years”. 2. The issued tracks can be found on several Hi compilations including the excellent 4 CD set “Royal Memphis Soul”. Special thanks to Colin Escott and Pete Nickols for info.